I see this meme pop up from time to time. And yes, I too feel a certain pang about the Library of Alexandria. Even so, I can’t help but wonder if our grief might be a tad misplaced. 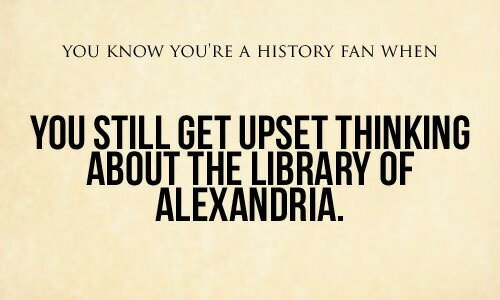 For one thing, just which of the four fabled destructions of the Library of Alexandria is supposed to still upset us? When it was accidentally burned by Julius Caesar in 48 BCE, or destroyed—again accidentally—by the Emperor Aurelian in 272 CE? When it was vandalized and plundered at the orders of the Coptic Pope Theophilus in 391 CE? Or are we talking about an apparently apocryphal incident, its supposed destruction by Caliph Omar in 642 CE? 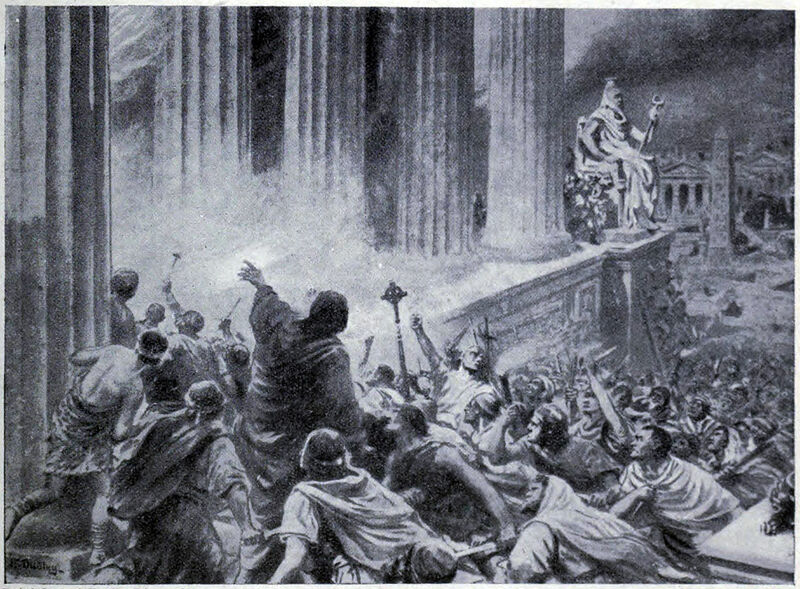 A single iconic “Burning of the Library of Alexandria” seems to linger in literate imaginations as a catch-all metaphor for the loss of any and all intellectual riches throughout the ages. But just what percentage of all the great ideas lost to time can really be blamed on those four purported catastrophes in that one place? A pretty small percentage is my not-so-humble guess. Had the destruction been complete — had every library been disassembled and every book burned — we might have lost Homer and Virgil and all of classical poetry, Herodotus and Tacitus and all of classical history, Demosthenes and Cicero and all of classical oratory, Plato and Aristotle and all of Greek philosophy, and Plotinus and Porphyry and all the subsequent commentary. Well, them’s the breaks. But what people of the early Middle Ages most needed wasn’t a good stiff dose of Demosthenes. They needed mundane things, such as a harness that wouldn’t press on a horse’s windpipe. Wright isn’t being as callous as he might sound. His guiding optimistic idea in Nonzero is that human history is a halting but inexorable proliferation of “non-zero-sum” games — a sometimes wobbly but ever-forward march toward increasing intellect, sophistication, and cooperation. This perpetual advance will continue, Wright insists, with or without the all-too-perishable poems, plays, novels, and artworks that we so touchingly revere. The truer essentials of progress are the more prosaic but vastly more durable technological memes ranging from horseshoes to iPhones — and these have an uncanny way of turning up when we need them. Oh, Septimus! — can you bear it? All the lost plays of the Athenians! Two hundred at least by Aeschylus, Sophocles, Euripides — thousands of poems — Aristotle’s own library … ! How can we sleep for grief? By counting our stock. Seven plays from Aeschylus, seven from Sophocles, nineteen from Euripides, my lady! You should no more grieve for the rest than for a buckle lost from your first shoe, or for your lesson book which will be lost when you are old. We shed as we pick up, like travellers who must carry everything in their arms, and what we let fall will be picked up by those behind. The procession is very long and life is very short. We die on the march. But there is nothing outside the march so nothing can be lost to it. THEODOTUS. The fire has spread from your ships. The first of the seven wonders of the world perishes. The library of Alexandria is in flames. THEODOTUS (unable to believe his senses). All! Caesar: will you go down to posterity as a barbarous soldier too ignorant to know the value of books? CAESAR. Theodotus: I am an author myself; and I tell you it is better that the Egyptians should live their lives than dream them away with the help of books. THEODOTUS (kneeling, with genuine literary emotion: the passion of the pedant). 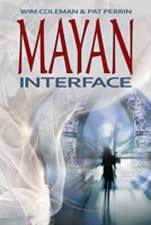 Caesar: once in ten generations of men, the world gains an immortal book. CAESAR (inflexible). If it did not flatter mankind, the common executioner would burn it. THEODOTUS. Without history, death would lay you beside your meanest soldier. CAESAR. Ay, and build the future with its ruins. This entry was posted in Thinking about story … and tagged Arcadia, Bernard Shaw, Caesar and Cleopatra, Caliph Omar, Emperor Aurelian, How the Irish Saved Civilization, Julius Caesar, Library of Alexandria, Nonzero, Robert Wright, St. Theophilus, Thomas Cahill, Tom Stoppard. Glad to receive this today, both because I found it fascinating, and a bit scary…The quote from Septimus especially, but so that I could wish Pat a very happy birthday tomorrow. I could not find a personal email for her, but this should do it: enjoy, celebrate, be well. I miss you. Abrazos.